Sometimes I go out of my comfort zone and create something new. I rarely used daikon radish but then I learned it was a nutritious food, with cancer-fighting powder it was time to put it on the grocery list. 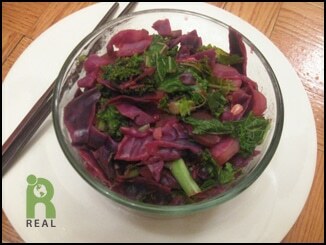 It’s a very versatile root vegetable and I have enjoyed it raw in salads and cooked as well, like in this stir-fry with two other cruciferous vegetables, kale and cabbage. 1. Mince shallots and garlic. Scrape skin off the ginger with the edge of a spoon and mince. 2. With a knife, scrape the exterior skin off the daikon. Slice into 1/4 inch or thinner rounds. 3. Wash the kale. Rip the leaves away from the stalks. Roll the leaves up into cigar shape cylinders and slice kale into strips (chiffonade). 4. Slice the cabbage into thin strips, 1/4 to 1/2 inch wide. 5. In a heavy cast iron frying pan or a wok, on medium high heat, add 1/4 cup of water. When the water starts to sizzle add the garlic, ginger and shallots. Stir regularly and cook for 2 or 3 minutes. If the pan dries out add a little more water. There should never be too much water or too little, just enough to coat the bottom of the pan, less than 1/4 inch. 6. Add the daikon slices and cook until they are soft. 7. Toss in the red cabbage. If your pan is not very big it may take a minute or two for the cabbage to shrink before you can stir it and mix it in with the other ingredients. 8. Add in the kale. Let it wilt and stir in with other ingredients. 9. When all the vegetables are soft, turn the heat off and toss in the lemon juice. ← Celebrating The 3rd Anniversary of IT’S ALL ABOUT FOOD!